I am trying to use the rest_Y_RegressOutCovariables function to write our covariable-corrected image files. I get the error below, which I was hoping you could help me with. I've double-checked, and the timeseries vectors are the correct length. I'm trying to run functional connectivity using ROI wise comparison between regions. After detrending, filtering, choosing ROIs, inputting covariables and performing the functional connectivity, the program gave me the expected text files. Does the ROI_FCMap_ file represent the time course before or after the covariable have been regressed out? If it is before the covariables have been accounted for, is there a way to acquire the time course after the covariables have been regressed out? could someone can help us to slove the problem ? This may seem like a basic question, but I just wanted to check whether entering the single-subject FC or zFCmaps produced by REST into a one-sample t-test in spm is an appropriate way to generate a group-averaged stat map. 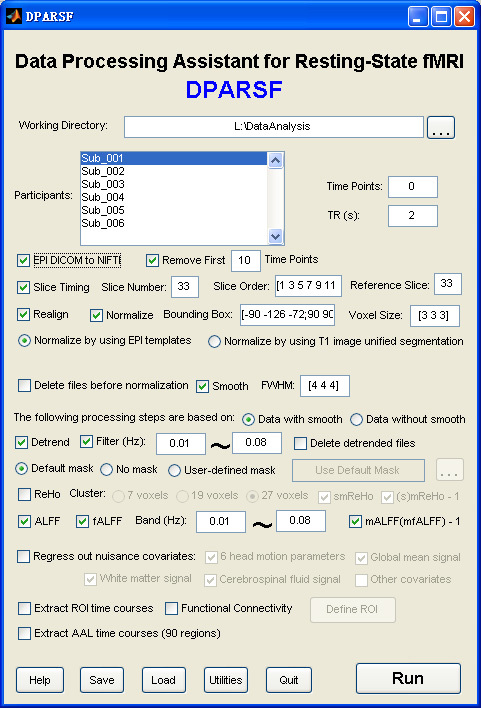 I'm trying to analyse my resting state fMRI data using by REST v1.3. You know, the results of REST is the z-map. But, I want to get the t-map. So, how I can transform z-map to t-map? Or, if I can't that, how can I interprete the result of z-map? Read more about How to decide the resample resolution? Why is the default 3mm*3mm*3mm? I am trying to run a correlation for a group of subjects at once. I have the timecourses for my seed ROI in text files. It seems however, that the option for defining voxelwise ROIs using text files only allows one file to be loaded at a time. Is it possible to load multiple text files, corresponding to the seed timecourses for each subject? 1 - If I include a global signal timeseries as a covariable, then the analysis will produce maps showing voxels significantly correlated with the seed timecourse after controlling for global signal fluctuations. That is, it is essentially like performing a global signal regression. Is this correct? 2 - Anticorrelations will be revealed by negative values in the resulting connectivity and z-maps. Is this correct? Read more about Pleae resmaple your mask or ROI definition file first!